Would you like to participate in a book club that has no meetings . . . no expectations . . . no rules? Welcome to the Online Book Roundtable! I’m not calling it a book club, because the word “club” implies that there are members, requirements, and an organizational structure. The Roundtable will have none of those pesky things. What we’ll do is choose a book each month, and as we read, we’ll comment on the book online (using the “comments” section of Books on the Table). The comment section does NOT require you to provide your name or email address. If you don’t want to provide public comments, please email me at bksonthetable@gmail.com and I’ll incorporate your comments anonymously in the discussion. I’ll provide reviews and related information about the book, and supply some discussion questions as we go along. We will plan on about a 4-6 week period from the time the book is chosen until we finish our discussion and choose the next book. Almost twenty-five years after the Isabella Stewart Gardner Museum’s infamous art heist—still the largest unsolved art theft in history—one of the stolen Degas paintings is delivered to the Boston studio of a young artist named Claire Roth. Claire, whose reputation has been tarnished by scandal and who now makes her living reproducing famous works of art for a popular online retailer, has entered into a Faustian bargain with Aiden Markel, a powerful gallery owner. She agrees to forge the Degas in exchange for a one-woman show in his renowned gallery. But as she begins her work, she starts to suspect that this long-missing masterpiece—the very one that had been hanging at the Gardner for one hundred years—may itself be a forgery. As Claire searches for the truth about the painting’s origins, she finds herself in a desperate race through a labyrinth of trapdoors, dead ends, and deceit, where secrets hidden since the late nineteenth century may be the only evidence that can save her from incrimination. Blending art history with passions of the heart, B. A. Shapiro allows us to smell the oil paint, see the brush strokes, feel the artist’s ambition and the collector’s fanaticism. As she explores the ingenious techniques of forgery and reimagines historical relationships, she reveals both the beauty of the artist’s vision and the ugliness the desire for great art can unleash. 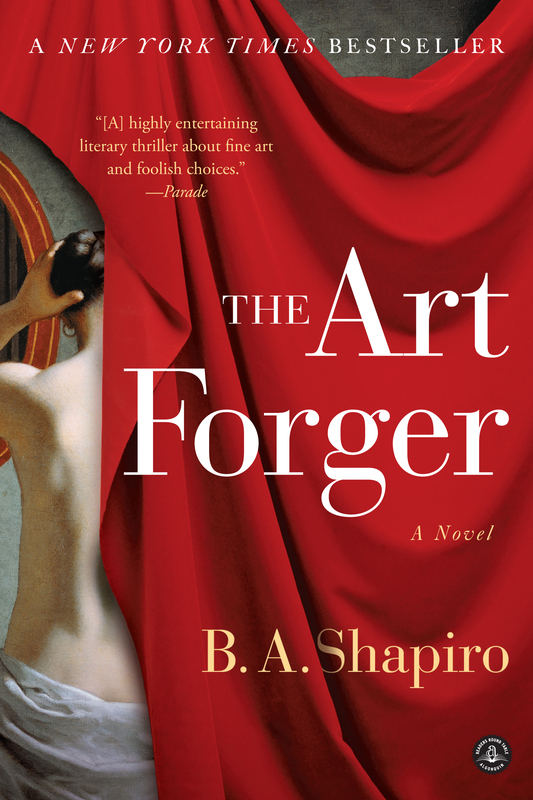 The Art Forger is a thrilling novel about seeing—and not seeing—the secrets that lie beneath the canvas. B. A. Shapiro lives in Boston and teaches fiction writing at Northeastern University. Please feel free to comment any time! Since we’re entering into the busy holiday season, let’s read and discuss The Art Forger through mid-December, and then start with a new book in early January. If your book club has discussed The Art Forger, I’d love to hear about it. The Lake Forest Book Store book club will be talking about the book next Tuesday (11/19) and I’ll report on that meeting. I started reading The Art Forger, because I plan on attending the Book Store book club next Tuesday. I’m not very far into it, but I am enjoying it, because I love a good mystery. The book reminds me of Provenance: How a Con Man and Forger Rewrote the History of Modern Art by Laney Salisbury and Aly Sujo. Both books are educating me about the art world…the good and bad sides of it. Art forgers have to be extremely gifted painters to reproduce the paintings of the great artists of the world, so that even the experts have a hard time telling the difference between the fake and the real. I wonder what would take more effort and energy for an artist? Creating one’s own personal style or studying a master and reproducing the master’s style? I think they are two different things but require great skill for both. From Sue: Just finished it this morning. What a good story and the pacing was perfect. I learned so much about the art world that I had no idea existed. I was particularly interested in the history and specifics of “copying” a painting especially one that is very old. I enjoyed the book. It really blurred the lines for me of what makes “art” art. I agree — well put! That’s something I had never thought about much until I read this book.